These individual lemon cream, apricot topped raisin loaves of bread are a perfect festive flavorful addition to any Easter breakfast, brunch or lunch. The base is a simple German raisin bread recipe. The ovals are topped with a rich mixture of mascarpone and quark with some sugar and lemon zest added for flavor. Quark is not easily found outside of Europe. In order to make quark properly, the process takes hours. A quick imitation recipe for German quark is included below. Note: while there are multiple steps to this recipe, this German raisin bread is broken down into workable categories to help you better plan for preparation and baking. Place the ingredients in a food processor and blend until smooth. Makes 8 ounces. Place the all-purpose flour in a large bowl and make an impression in the middle. Dissolve the yeast in 4 tablespoons of the lukewarm milk. Stir the softened yeast into the all-purpose flour. The result should look like shredded dough. Cover the bowl with a dish towel and store in a warm place for 20 minutes. Once again, cover the bowl with a dish towel and store in a warm place for 60 minutes. The size of the dough should double in this time. Retrieve the dough and turn it out onto a lightly floured work surface Divide the dough into 12 portions. Roll each portion out into a flat oval. If you have a large egg shaped cookie cutter, you can use that to create more precise ovals. I used a 5 1/2-inch by 4-inch oval cutter. Transfer the dough ovals to the parchment lined baking sheets and let rest for another 30 minutes. Preheat the oven to 350 F. Lightly beat the egg yolks together in a small bowl. Use a pastry brush to coat the dough ovals. Remove the bread from oven and transfer to a wire rack to cool completely. Whisk together the mascarpone and quark. Whisk in the 3 tablespoons of white granulated sugar. Add the freshly grated lemon zest and combine. Use a pastry knife or a butter knife to spread the lemon cream mixture out onto the tops of each oval. Peel the fresh apricots, cut in half and discard the pit. Alternately, drain the apricots in the can and pat each half dry. If you like, reserve the juice for future use or discard. Place one apricot half on top of each bread centered in the middle. Heat the apricot jam briefly in the microwave or on the stovetop. 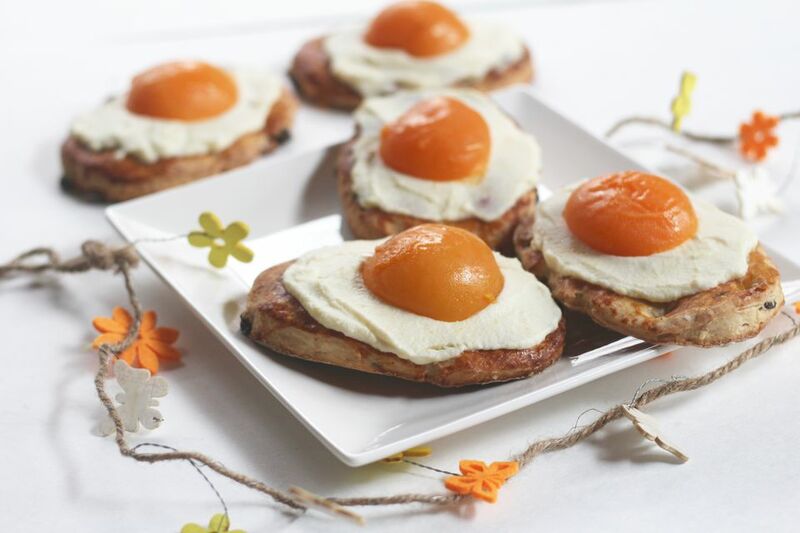 Use a small pastry brush to coat the apricot half with the apricot jam.